It’s a chic and modern hotel right near Broadway & Timesquare. Quick walk to many attractions and the subway. I wished I would’ve stayed longer. I love everything about this hotel the location & amenities! The picture made the room look bigger than what it is. I booked room with view which was not available at 3PM check in time. They took off my resort fee for that. The main problem is the room smells very bad. They came in to take a look but had no solution. It smells like those $20/night vegas hotel. Same smell in the hallway. Great location, very nice staff, room is pretty and looked clean but there was hair in the bathroom. Bed very soft and gonstructionongoing oitside. Expensive which is expected because it’s holiday, sofa bed don’t even have covers, blankets and pillows, this was rush clean up, they said under amenities free bottled water haha it’s a free plastic cup and you have to get your water in a dispenser , would never stay here again. I would exchange this with comfort inn around the corner which I just checked out right before New Year’s Eve thinking I want to treat my family in a better class hotel it look good in the picture. It’s a sad deal. This hotel is a disgrace of a 4* hotel. Outside looks amazing, entrance looks amazing and that’s about it. Check in - long queues as it seems they are always understaffed. The room - very very small room, bathroom needs a serious update tiles falling of the walls, shower curtain needs replacing, no space to put any toiletries. They also “forgot” to clean our room one day and we came back at 9 pm and had to wait 45 min until it was clean and able to go back into our room. Staff - the staff at the reception are extremely rude and unprofessional!! You can ask them any question and without even checking - they will have an answer. And that answer is always No! !- Weather the question was to pay for an upgrade. To pay for late check out always no. One of the ladies at reception had the audacity to say to me that check out was at 11am and she will do me a favour and let me check out at 12pm!!! When check out is normally 12pm! Also no place to hang out as at 10:30pm they close the seating area because they are too cheap to hire a security guard to let just guests in! If you leave your bag at the left luggage locker they will ask you for a tip when you drop it off and when you pick it up!.... not sure why? I honestly wouldn’t recommend staying at this hotel until new management come in. The hotel was in a great location. We didn't find any issue with the elevators and never waited more than a few minutes. The room was ok. There was quite a bit of dust around the edges of the carpet but it seemed ok. Location is great, but hotel leaves some things to be desired. Check-in was slow chaos with only 2 staff & a line 20 people deep. Terrible shower water pressure, thin walls (loud! ), no room service, pricey resort fee tacked onto checkout. I'll stay elsewhere next time. Located in Midtown, Row NYC is next to popular attractions like Music Box Theatre and The Majestic Theater. This 4-star hotel welcomes guests with conveniences like free in-room WiFi, a fitness center, and a 24-hour business center. This hotel is home to 2 onsite restaurants, perfect for a quick bite to eat. Get a pick-me-up at the coffee shop/café. Start each morning with continental breakfast, available for a fee from 7 AM to 11:30 AM. A 32-inch LCD TV comes with cable channels, and guests can stay connected with free WiFi and wired Internet. Pillowtop beds sport premium bedding and the bathroom offers a hair dryer and free toiletries. Other standard amenities include an iPod dock, a laptop-compatible safe, and a phone. 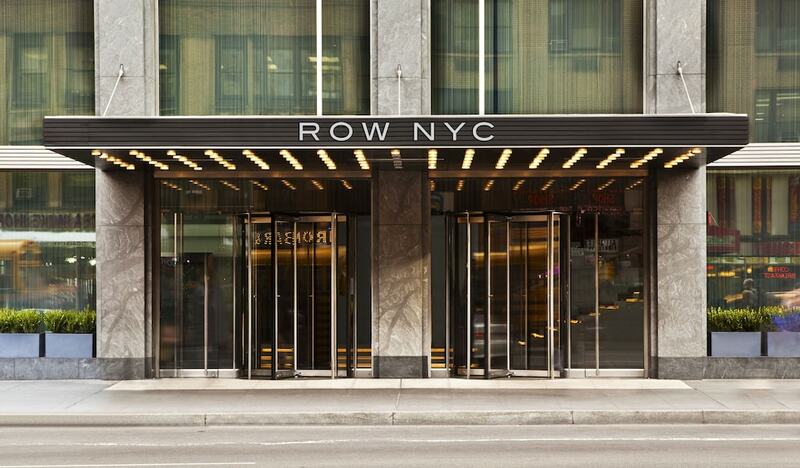 At Row NYC, guests have access to a fitness center, free WiFi in public areas, and a 24-hour business center. Self parking is available for USD 40 per night. Multilingual staff at the 24-hour front desk can assist with luggage storage, securing valuables, and tours or tickets. Additional amenities include a computer station, express check-in, and express check-out. Continental breakfast is served daily from 7 AM to 11:30 AM for a fee. District M - Bar open daily for breakfast and dinner. City Kitchen - Restaurant and bar serving breakfast, lunch, and dinner. Open daily. Recreation features at Row NYC include a fitness center.